The USB-4700 series consists of true Plug & Play data acquisition devices. No more opening up your computer chassis to install boardsjust plug in the module, then get the data. It’s easy and efficient. 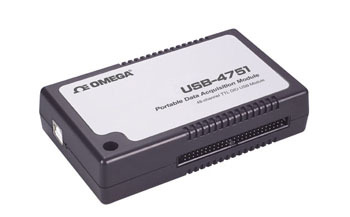 Models USB-4751 (48-bit) and USB-4751L (24-bit) are digital I/O data acquisition modules for the USB bus. The 48/24 bits are divided into six/three 8-bit I/O ports, and users can configure each port as input or output via software. The USB-4751 and USB-4751L also provide one event counter and three 16-bit timers, which can be cascaded to become a 32-bit timer. Data collection is simple. Simply plug the data acquisition module into an available USB port and our easy-to-use Windows software does the rest. The software converts your PC into a real-time strip chart recorder. Data can be printed in graphical or tabular format. It can also be exported to a text or Microsoft Excel file.